William Green, better known in the stunt profession as “Duke Green” was a superb athlete, adept at swimming, high diving, tumbling, fights and all manner of falls. Duke Green wasa mainstay of the Republic serial stunt team. His career in films began way back in 1925 when he was hired to double for John Barrymore in “The Sea Beast.” Barrymore took a liking to Green and he worked in many of the actor’s other films with “Don Juan” being the standout. Establishing himself in Barrymore’s troupe, Duke was one of the most sought after stuntmen in the game. He was with the great cowboy star Buck Jones for years, doubled for Jack Oakie, J. Carrol Naish, Humphrey Bogart, Edward G. Robinson and most other leading men of their day that he fit physically. One of Duke’s most memorable contributions to free for all fights is the massive saloon brawl in “Dodge City” starring Errol Flynn, with Duke initially crashing through a staircase and later going head first through a breakaway window. It is Duke Green’s work in serials that is usually the focal point of any discussion regarding his work. Though he had done serial work for other studios, Duke’s true stunt highlights came to the forefront at Republic. He was one of Fu Manchu’s henchmen in the classic “Drums of Fu Manchu”. 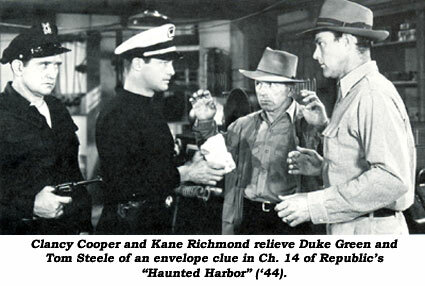 He played a civil engineer in “Manhunt of Mystery Island”. He was even killed in the first reel by veteran heavy Kenne Duncan, whom he, incidentally, doubled throughout the whole serial. He battled Duncan Renaldo (doubled by Davey Sharpe) in “King of the Texas Rangers” and got knocked off a platform by Kane Richmond in “Spy Smasher”. Over 25 of Republic’s serials saw some of Duke Green’s stunt prowess including “Lone Ranger”, “Adventures of Red Ryder”, “King of the Royal Mounted”, “Jungle Girl”, “Tiger Woman”, “Capt. America” and “Black Widow”. Green often played more than one role in a serial, sometimes as many as six or seven parts. Throughout his tenure at Republic he worked in B-westerns with Don Barry, Bill Elliott and Roy Rogers as well as some of Republic’s A-westerns with Rod Cameron and Forrest Tucker. In 1950 Duke was seriously and irreversibly injured. The film was “The Flame and the Arrow” starring Burt Lancaster. Duke was to catch his foot in a snare on a forest pathway and be whipped upright off his feet. The stunt went wrong when the rigging from the platform above him broke. Green hurtled headfirst to the ground, breaking his neck and effectively ending a stunt career of 25 years. There were many painful operations, fusing of the spine and months and months of agonizing convalescence. There was no insurance in those days and all Duke got was workmen’s compensation. When he was able to work again, Duke did some extra work to keep some sort of money coming in, but a spectacular stunt career had come to a premature end. Sadly, Duke Green has passed away but he was not bitter. He stated in interviews to people who sought him out at his home in North Hollywood that he’d loved every minute of his film work. Well Duke, so do we and all of us truly are grateful to you for all the thrills you provided. 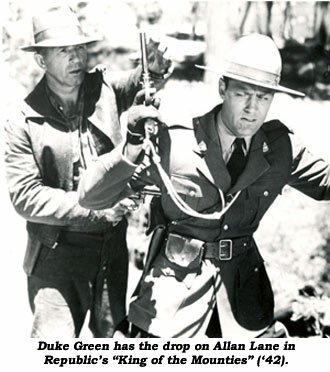 Now, with Republic serials on video we can once again marvel at stuntman William “Duke” Green.